I have been tattooing full time at reputable studios since 2008 and work at South Main Tattoo in Doylestown by appointment. I live in NY state and tattoo here a few times a year. I enjoy using linework in all of my designs but I also love to do black and gray work without lines. in pencil, colored pencil, or marker. I have quite a bit of experience with portraiture, including humans as well as animals. For pleasure I create distorted, abstract portraiture in pencil. 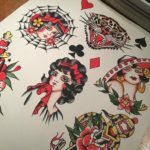 Please see my tattoo portfolio below, also a well rounded collection of my works on paper through the years, commissioned and personal, that I feel summarizes what I like to do/am capable of doing.